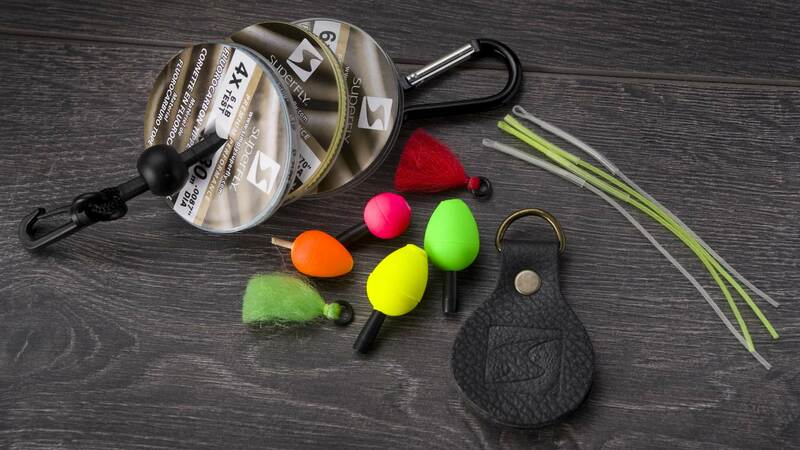 Superfly’s fly fishing line accessories will help you manage your line and keep it in tip-top shape. Superfly’s 30-pound braided loop connectors make changing leaders easy. They attach securely to the fly line with a stronger connection than a traditional nail knot. Easy-to-use instructions are included. Ours is simple but effective. Simply place the leader between the two pads and pull through, applying pressure as required. This handy accessory will straighten the line quickly and spare your hands from line burn. Tippet is something you’ll want to keep handy, and a spool holder keeps several types of tippet close and securely connected to you or your gear. High-floating, synthetic yarn indicators help detect subtle strikes. Easily attach by looping the leader through the O-ring with a slip knot. Assortment includes four different colors for use in variable light and water conditions. Toothpick strike indicators are available in two sizes. They are easy to see and easy to adjust and can also help stop flies from snagging on the bottom.